The use of crystals for their metaphysical energetic properties is a practice that has been around for centuries. 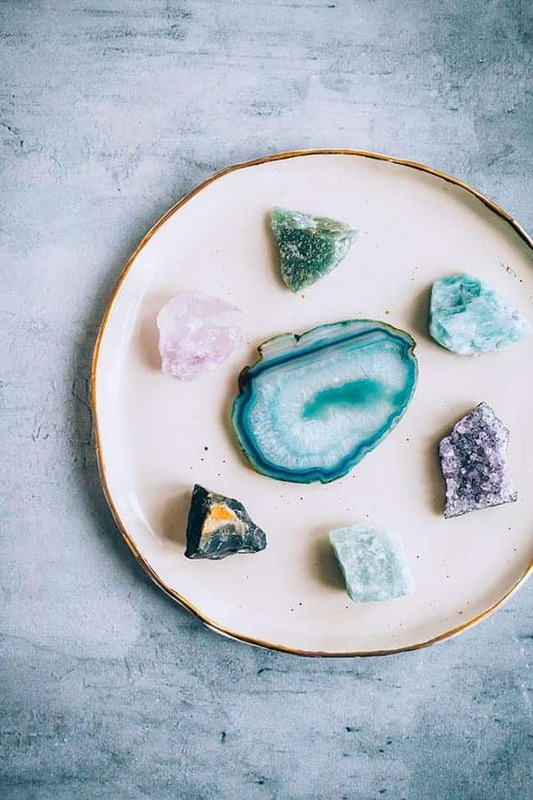 More recently, the popularity of crystals has gained a resurgence—you may have encountered them in a Reiki healing session, a spa treatment, or in your local yoga studio boutique. If you have been curious about crystals and how you might begin to incorporate them into your life, here’s a quick introduction to help you get started. Crystals are believed to hold special vibrational qualities, and when they are in proximity to the body, can encourage feelings of wellbeing. They are often used for protection, mood regulation, relaxation, healing, releasing negative energy or for awakening spiritual/psychic abilities. Enthusiasts turn to crystals to help with a vast spectrum of issues, from reducing nightmares to protecting their travel at sea, from mending a broken heart to increasing self-confidence. If you’re in need of assistance or healing in an area of your life, chances are there’s a crystal for that! Another technique used for selecting crystals is to think of the particular energetic properties you are seeking, and then, if you are lucky enough to have a shop in your area, to wander around and allow their diverse energies to speak to you. When you feel drawn to a stone’s particular shape or color, listen to that inner wisdom when making your choice. The shape of the crystal may also influence your selection. A small, round, tumbled stone would be good to carry in your pocket, a pointed crystal is best when you need to direct energy towards or away from you, and a sphere radiates energy evenly in all directions. A generator is a six-sided crystal ending in a point which is powerful and can also amplify the energy of the crystals nearby. While some crystals have vibrations that are aligned with the energy and colors of the chakras, many of the most popular and versatile stones fall outside of this structure. A good place to start your own collection might be to choose from these superstar powerhouses. Black Obsidian: This black stone is a great choice to shield you from negative energy. It also helps to stimulate the safe and secure feelings associated with the root chakra. Selenite: This is a great stone to aid in meditation and spiritual endeavours, and it also helps when you need to feel protected. It is aligned with the crown chakra, and is also used to alleviate sleep disorders. Clear Quartz: This crystal amplifies the powers of the other crystals nearby. It is also a great stone to have around when you’re feeling out of balance emotionally. This is the classic healing stone, so if you’re ever in doubt of what you need, find yourself one of these! Smoky Quartz: Smoky quartz balances the root chakra, and lends a settled, down-to-earth vibration, making it a very helpful stone for people with anxiety. Rose Quartz: This pink crystal is best known for its ability to promote the emotional healing of the heart and to support feelings of love, both for self and others. Amethyst: Known as the “sobriety stone”, this is a crystal that encourages a balanced, temperate energy, and holds the power of encouragement for those seeking to abstain from excess. It’s also a stone with a generalized positive energy. Citrine: This is the happiness crystal. It stimulates feelings of pleasure, success, confidence and enjoyment. Moonstone: This opalescent crystal is considered a “yin” stone, or a feminine crystal. It is known as a woman’s healing stone, and is the go-to crystal for fertility or issues relating to hormones or the menstrual cycle. Moonstone is also a great choice for women looking to heighten and embrace their inner goddess energy. Many people incorporate crystals into their meditation practices by resting a stone upon their yoga mat or near their meditation cushion, or by holding it in the cup of the hand when seated. They can also be laid upon the body when in a reclined meditation. Crystals can also be carried with you throughout the day, in your pocket to be held when you need to feel calm or balanced, or as jewelry. Another common practice according to some of my crystal enthusiast friends is to wear your stone tucked inside of your bra—close to your heart and circulatory centre. You can also use crystals to settle the environments around you. 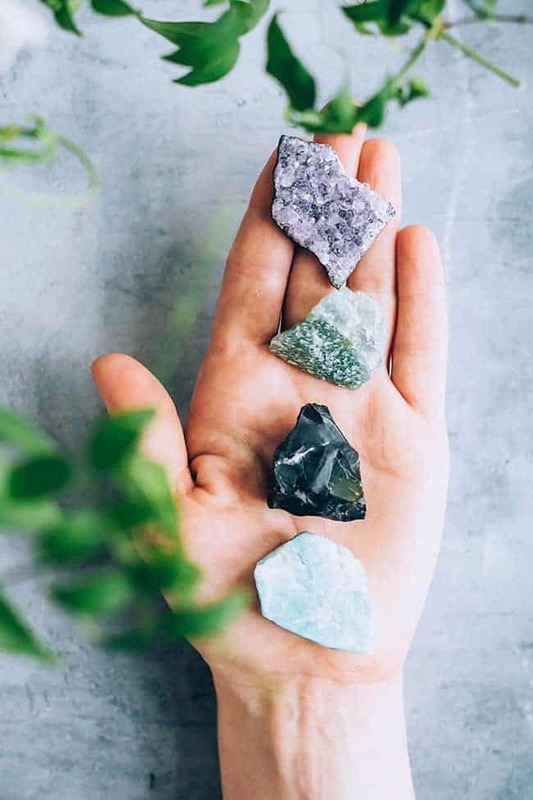 Keeping a positive energy stone in your car or at your desk at work can assist in keeping some heavier negative vibes at bay, and placing larger stones around your home can help to encourage the feelings of a healthy, balanced space. Place a clear crystal in the four corners of your home to encourage stability and protection. When you first bring your crystals home, it’s a good idea to give them a good cleaning. You’ll also want to cleanse the crystals that absorb negative energy on a regular basis. Keep your stones dust free, and give them a wash in salt water if needed. Cleansing the accumulated energies of the stones can be done by placing them in a bowl of dry salt for a few hours, by setting them outside overnight under the high-octane energy of the full moon, or by smudging them with sage or palo santo smoke. Whether you subscribe to the idea that crystals hold these superpowers or not, using stones that encourage positive emotional states and feelings of wellbeing could be seen more as a mindfulness practice. Whenever you reach into your pocket and feel the curve of your rose quartz, for example, you may be reminded that your heart is healing. When you feel the warm, round weight of the obsidian, you may be more open to receiving the message that you are supported and that you belong. Deeply impressed by the powers of crystals. Nice share. You know, I haven’t had much luck with crystals, but they seem to work great for overpriviledged trash who have never had a real problem in their entire life. It’s ok that they didn’t work for you. They do for some people, and others not. It isn’t nice to post hate, though, and please refrain from doing it again. If the crystals didn’t work for you, I recommend cleansing them and trying again. Make sure to meditate too! Thank you! I’m just starting to be interested in crystals and I needed a clear and interesting post like yours!